Yesterday (Dental Elf 10th July 2014) we looked at a trial that compared dentures made with silicone and alginate impression materials. In a study undertaken alongside that trial the authors aimed to assess the cost effectiveness of silicone and alginate impressions for complete dentures. The cost effectiveness analysis (CEA) took the perspective of the UK NHS health care system. The cost of resources used to construct the dentures, costs of adjustments made for both dentures and other health service costs resulting from problem with the dentures (for example, GP visits). The effectiveness component of the cost effectiveness analysis is assessed in two ways; using the EuroQol (EQ-5D-3L) that can be combined with time to produce quality adjusted life years (QALYs); and the Oral Health Impact Profile (OHIP-EDENT).Costs were obtained from national sources and where necessary adjusted to 2012 prices using the CCEMG–EPPI Centre Cost Converter. All patients who did not withdraw in the trial were included. The outcome of the CEA was an incremental cost per QALY/OHIP-EDENT point. Sensitivity analyses were carried out to account for uncertainty in the cost values. Mean cost was higher in the silicone impression group (£388.57 vs. £363.18). Negligible between-group differences were observed in QALY gains; the silicone group had greater mean OHIP-EDENT gains. The additional cost using silicone was £3.41 per change of one point in the OHIP-EDENT. The silicone arm was more costly, driven by the cost of materials. Little change was observed in generic health related quality of life; however, the change in OHIP-EDENT score showed great improvement in the silicone arm and the difference between arms was statistically significant. Given the negligible QALY gains and low level of resource use, results must be treated with caution making it difficult to make robust claims about the comparative cost-effectiveness of either material. Not many economic analysis studies are conducted in dentistry and fewer are bases on well-conducted randomised studies as is the case for this study. As the authors point out in their discussion the difference in OHIP-EDENT scores between the silicone and alginate groups can be seen as beneficial to the patient and the balance between the increased cost of £30 per patient for silicone impressions and the improvement in the patients’ quality of life needs to be taken into consideration. Hulme C, Yu G, Browne C, O’Dwyer J, Craddock H, Brown S, Gray J, Pavitt S, Fernandez C, Godfrey M, Dukanovic G, Brunton P, Hyde TP. 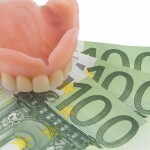 Cost-effectiveness of silicone and alginate impressions for complete dentures. J Dent. 2014 Mar 13. pii: S0300-5712(14)00073-6. doi: 10.1016/j.jdent.2014.03.001. [Epub ahead of print] PubMed PMID: 24995472.